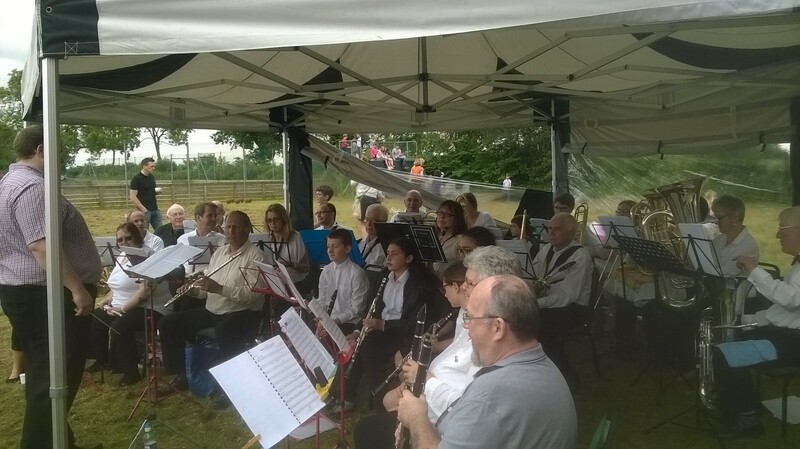 Nene Valley Community Band will be performing at the Umbrella Fair Festival again this year on the 21st of August 2016. We’ll be returning with an expanded repertoire but the same variety of musical styles. Although it’s peak holiday season, we’ll be there in numbers and make a good showing. Our next outing will be at Naseby Fete on the afternoon of 11th June, and following that, we hope to be appearing at the Umbrella Festival in Northampton – so come and support us … or pick up that dusty instrument and join us … either would be great. 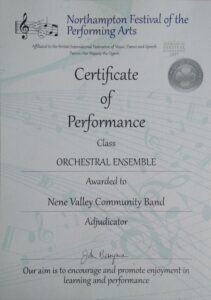 Didn’t we have a loverley time …..
Sunday, 22nd May saw Nene Valley Community Band participating in the Northampton Festival of the Performing Arts for the first time. It was ‘Brass’ day and we entered in the Orchestral Ensemble class, performing medleys from Pirates of the Caribbean, and Fiddler on the Roof. John Berryman, the Adjudicator, was highly complementary about our performance, and also gave some very useful feedback so we know what to focus on to improve. Andy Johnson, our Musical Director, will be studying that closely and making sure we pay attention to the details. We weren’t the only show in town, though. Our own Anna Langton played a solo on Euphonium, and then played a duet with James Dixon on trombone, and received positive feedback for both – and we must mention the Liberty Drum Corps, led by Dale Willis (alto sax with NVCB) who entered the Orchestral Ensemble class and came away with a very well deserved ‘Outstanding’. Apart from those specific mentions, it was wonderful to hear all of the younger participants in ensembles, playing duets and solos. We were very impressed by the skill, musicality (and sheer bravery) of the participants. Will we be back next year? You bet!